Enjoy live music in Alicante at this year's budget-friendly Spring Festival 2019. 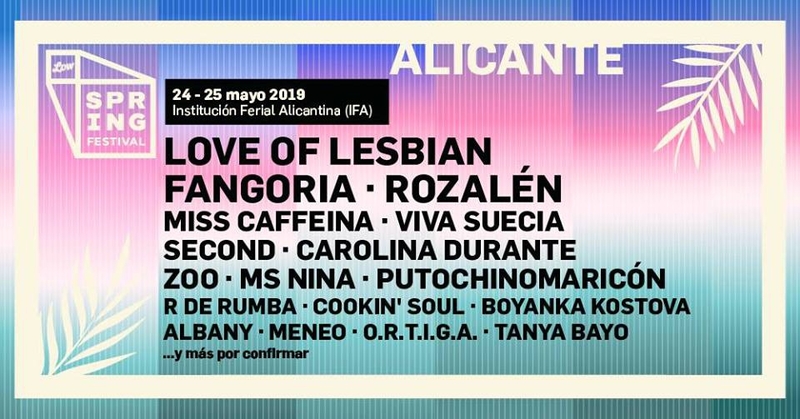 On May 24 and 25, the IFA in Alicante hosts SpringFestival2019 with Love of Lesbian - their ONLY concert in the province - Fangoria Warner, Viva Suecia, Carolina Durante, Zoo, Ms Nina ... And there are still bands to be announced! IFA will host the new Spring Festival. As well as public transport to get to the festival, IFA is putting on a fleet of buses that will get from Luceros in just 15 minutes. Concerts at a reduced price from the best independent bands in the country in the Stereo room in Alicante. Free exhibitions and concerts in Alicante. The spirit of Low Festival returns to Alicante 10 years later with its younger version. Welcome to #SpringFestival2019!